This odd-looking plant is Massonia pustulata, a member of Liliaceae from South Africa. I must have seen a photograph of it, or read of it, and was attracted to it as a curiosity. The label 1/97 suggests that it was grown from A.G.S.seed. Such seed was on offer in the Seed Exchange this year. 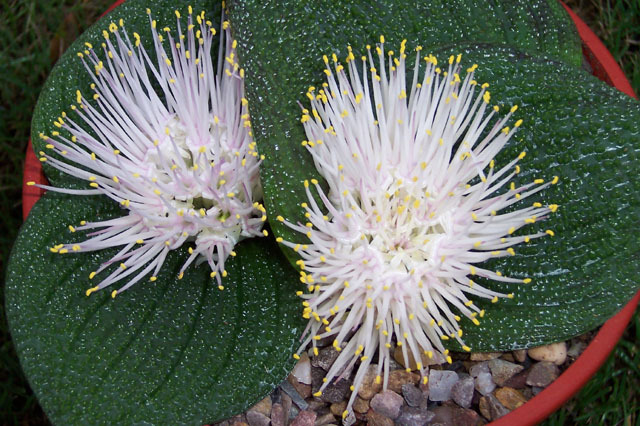 It is kept in the alpine house, has been repotted several times, presently in a 5" pot, and perhaps needing one slightly larger. The compost is 60% John Innes no. 3 and 40% grit. There are currently two bulbs, each with two stiff, prostrate leaves, shiny and pimply. Each flower consists of many six-sided florets; each floret with six stamens; female parts not easily seen. This is the fourth year of flowering which provides a welcome bit of colour from the end of November through into January. The flower is said to be fragrant, but I cannot confirm that. Volume 2 of the A.G.S. Encyclopaedia says it is the hardiest of the several specimens listed. and likens the flower to a shaving brush.